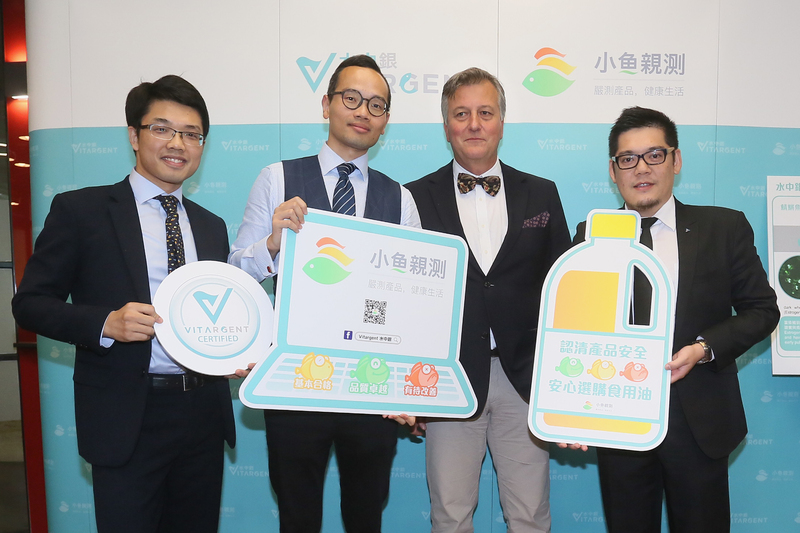 (Hong Kong, May 23, 2017) Vitargent (International) Biotechnology Ltd. (“Vitargent”), known for applying its proprietary “Transgenic Medaka” and “Zebrafish Fish” Embryo Toxicity (FET) testing technology (Testing 2.0) on food and skincare products, introduces the world’s first consumer product safety information platform, Test-it™. The platform uses Testing 2.0 biological testing technology to examine consumer product safety and has published the results of the inaugural test project on 115 types of edible oil originated from Hong Kong, China, Italy, the US and other countries. Test results put 49 types of oil in the Green Fish category, denoting the products are excellent in terms of safety; 23 in the Yellow Fish category, indicating their safety level is basic, and 43 are categorized as Red Fish, with safety at sub-optimal standards. More than 70% of the olive oil samples are categorized as Red Fish, and edible oils from Europe turned out to have the lowest performance, with more than 50% of the samples categorized as Red Fish. Pioneered by Vitargent, Test-it™ (on www.fishqc.com) is hailed as the first in the world to use Testing 2.0 bio-testing technology on consumer products and provide information on consumer product safety. The technology uses fish embryos to examine product toxicity, an increasingly adopted means for toxicity screening. The goal is to enhance the transparency of consumer product safety and help consumers make informed safer product choices based on objective scientific data. Vitargent’s Founder and Chief Commercial Officer Eric Chen said: “Traditional Testing 1.0 and existing regulations only set the basic requirements for market entry. Test-it™ regularly samples different food items and daily necessities, by purchasing them from supermarkets, chain stores and online stores as a consumer. After Testing 2.0 screening, individual products are categorized as Green Fish, Yellow Fish or Red Fish to help consumers identify product safety.” Test-it™ benchmarks against the international product safety standards of the European Union (EU), the World Health Organization (WHO) and the Organization for Economic Co-operation and Development (OECD), as well as the national safety standards of the US, Japan and China. Horizontal analyses against similar products are also conducted. • Green Fish means “Excellence” in safety, indicating good performance under screening of acute toxicity, chronic toxicity and banned ingredients. Consumers can rest assured that the products are safe for purchase. • Yellow Fish means “Basic” in safety, meaning a product meets the safety baselines in the screening of acute and chronic toxicity and banned ingredients. Consumers are recommended to purchase with caution. • Red Fish means “Sub-Optimal” in safety, indicating a product is below standard in one or more criteria in the screening of acute and chronic toxicity and banned ingredients. Consumers are recommended to purchase with extra caution. The first type of Test-it™ product is edible oil, a daily necessity marred by gutter oil scandals. Vitargent purchased 115 types of edible oil from major supermarket chains, including ParknShop, Wellcome, DCH Food Mart, AEON, City’Super, Fusion and Market Place by Jasons. Samples included products of internationally renowned brands such as Knife Oil, Filippo Berio, Lion & Globe, Casino and others from Hong Kong, Mainland China, Italy, the US and other countries. Based on the test results, 49 of the 115 samples are categorized as Green Fish, 23 as Yellow Fish and 43 as Red Fish. Vitargent tested 14 categories of commonly used edible oils. The test showed that coconut oil, olive oil, flaxseed oil, canola oil and sesame oil, generally believed to be healthier by Hong Kong consumers, had below average results. Only one out of 5 coconut oil samples, or 20%, is categorized as Green Fish, while 2 samples (40%) are Yellow Fish and 2 (40%) are Red Fish. Similarly, only 7 out of 44 olive oil samples tested (16%) are Green Fish, 7 (16%) are Yellow Fish, and 30 (68%) are Red Fish. All the flaxseed oil, Canola oil and sesame oil tested are categorized Red Fish. By production origin, edible oils made in Europe are lowest in ranking. More than half of the tested products (57%) are Red Fish, and only 26% are categorized Green Fish. Oils made in Asia performed better. About 20% of the Hong Kong brands in the test are Red Fish while more than 50% are categorized Green Fish, which are safe choices for consumers. The test results also show that expensive oil may not be safer. The median price of the 115 samples is HK$87.4 per litre. Of the 40 brands priced at above $130 per litre, six are categorized Green Fish, five Yellow Fish and 29 Red Fish. Of the 31 samples in the price range of $50-$130 per litre, 13 are categorized Green Fish, eight Yellow Fish and 10 Red Fish. Among the 44 samples priced below HK$50 per litre, 30 are categorized Green Fish, 10 Yellow Fish and four Red Fish. The cheapest oil costs $15 per litre while the most expensive oil, from Italy, costs 140 times more at HK$2,084 per litre. In the random sampling, two edible oil samples that Vitargent bought off the shelf had passed their use-by date. One of these samples is categorized Red Fish, indicating toxicity level higher than some known gutter oil. The general public is deeply concerned with food and consumer products safety as scandals of rotten meat, gutter oil, high lead content in drinking water and cancer-causing substances in skincare and cosmetics continue to make headlines. WHO and UN reports suggest we are surrounded by more than 100,000 chemicals in our daily life1. Some are linked with health problems like cancer, infertility, precocious puberty, obesity, neurological disorders2. However, the precision rate of traditional chemical toxicity testing, still at the Testing 1.0 level, is as low as 20%3. Due to cost and time constraints, only 5 to 10 toxicants can be screened at one time through such traditional test methods. Other harmful substances not covered by standard testing will be missed in the screening. This means products that have passed traditional testing methods may still contain harmful substances not covered by existing screening practices. This may pose serious threats to consumers. Vitargent plans to test a different product category every month in the next 12 months, some examples may include coffee, ice-cream, milk, yogurt, face cream, facial masks, lipstick, lip balm, foundation, toothpaste, baby food and baby skincare products. Results of the tests will be published on the Test-it™ platform. 1. Substance Registry Services Fact Sheet, available at ofmpub.epa.gov/sor_internet/registry/substreg/educationalresources. 3. Frequently asked questions about MICROTOX® for drinking water surveillance. 4. Howe, K. et al. The zebrafish reference genome sequence and its relationship to the human genome. Nature 496, 498–503 (2013). Established in 2010, Vitargent is a pioneer in the field of safety testing technology. With hands-on guidance from our Scientific and Business Advisory Boards, we combine technological expertise with social responsibility. We are the proud winners of the Grand Prix at the International Exhibition of Inventions of Geneva (2015). © Copyright 2016 - Vitargent (International) Biotechnology Limited.